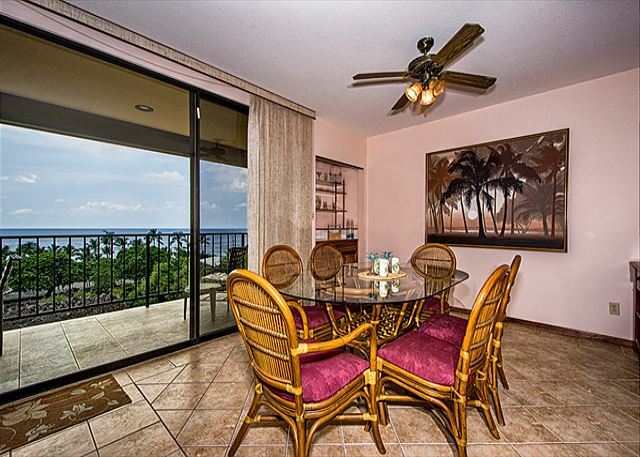 Spacious lanai with amazing ocean view! 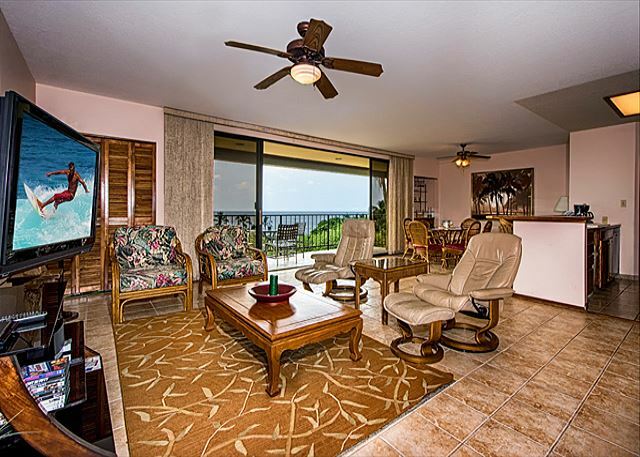 Relax on the lanai, and enjoy a pool and ocean view from the top floor! Gorgeous open floor plan. Very spacious with ocean views! Another shot of the living room! The living room has a pullout sofa too! The property can sleep 6! 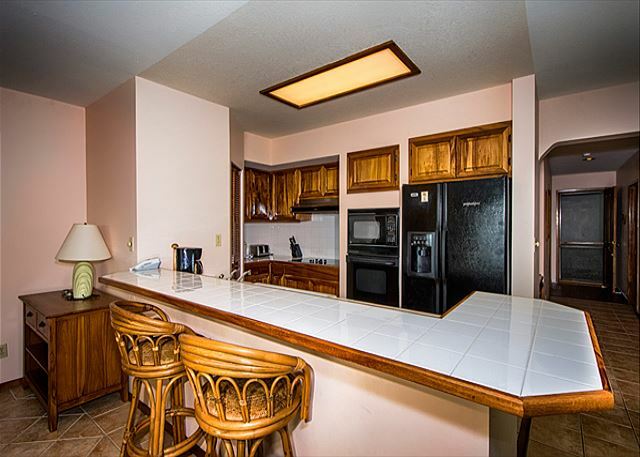 Fully Equipped Kitchen with Bar area, and bar stools! Master bedroom features very comfortable King Sized bed? Master bedroom has a very comfortable King Sized bed! 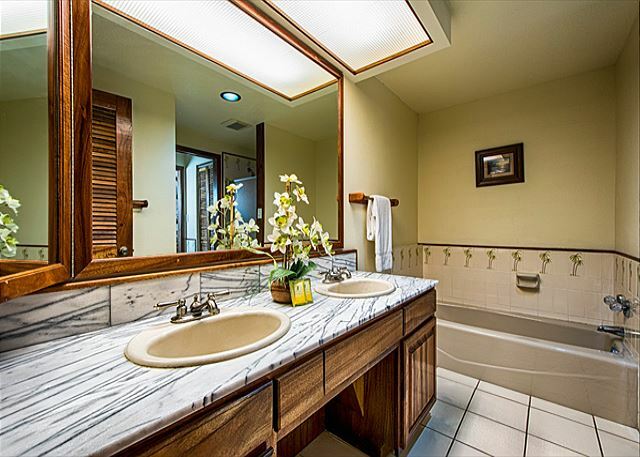 Master bathroom features double sinks, bath tub, and stand up shower! 2nd bedroom features 2 twins! They can be pushed together to be a King if need be! 2nd bathroom identical to master! 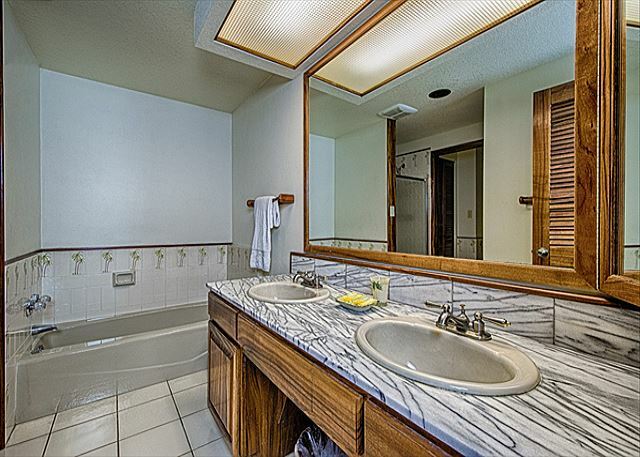 Has double sinks, soaking tub, and stand up shower! Another view from the lanai! 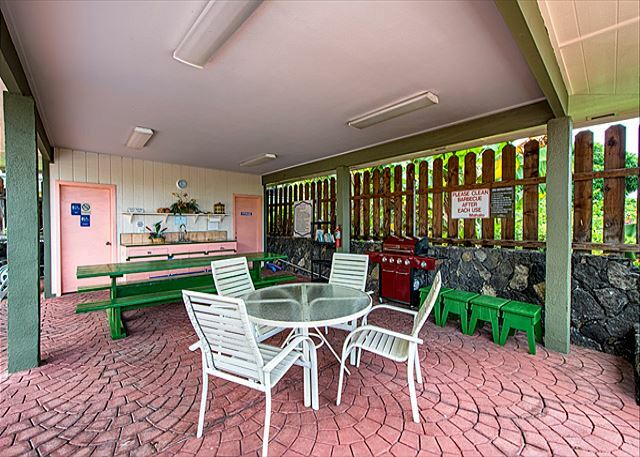 Enjoy the use of the BBQ by the pool area! 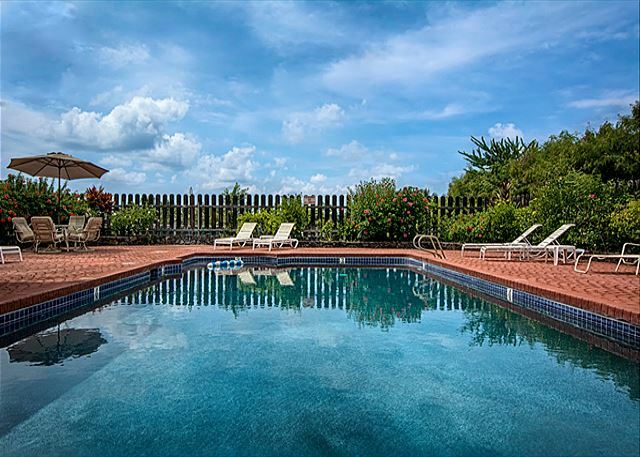 An amazing pool for your enjoyment! 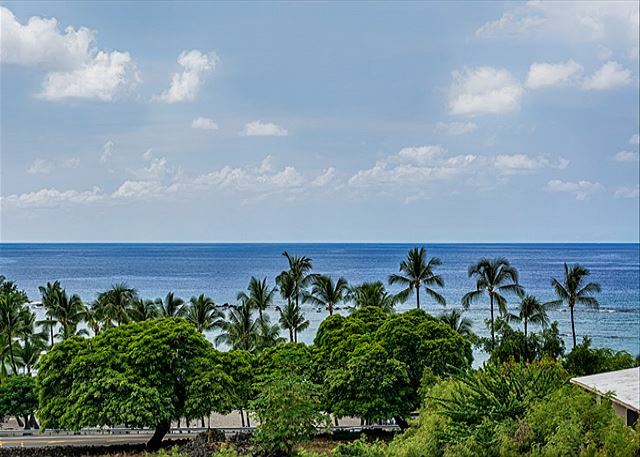 Famous Kahaluu Beach is right across the street from the complex! 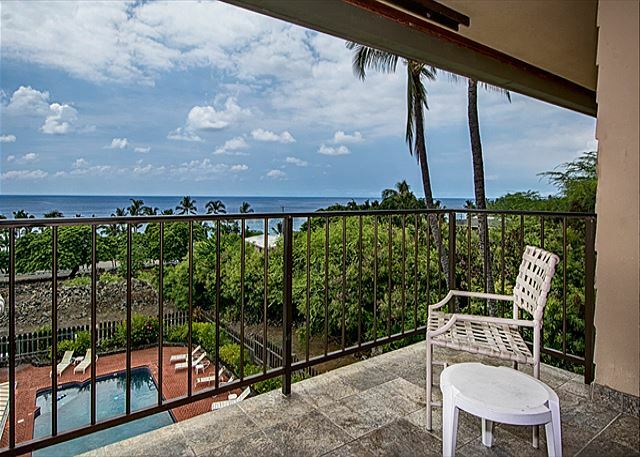 This beautiful, private top floor condo at Kahaluu Bay Villas is quite the gem. The unit has a well equipped kitchen and all the rooms are spacious with a balcony overlooking the pool and the ocean. The bedrooms and baths are wonderfully appointed. The living area is open and airy. Everything that is needed for staying in a condo is provided, even the snorkeling gear. 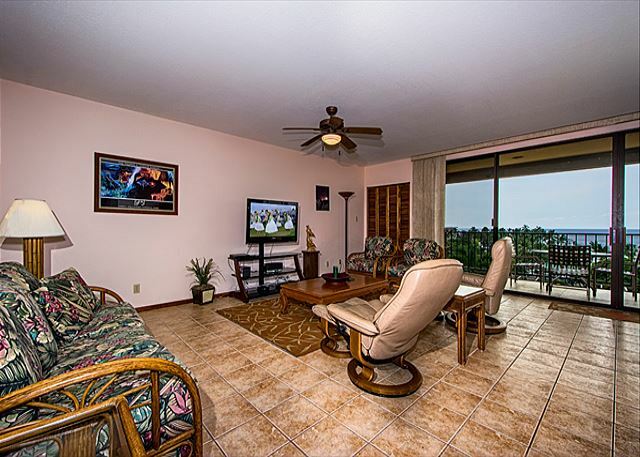 The views of Kahaluu Bay and the condo pool from the balcony are unobstructed and beautiful. Watching the sunset or the boats in the bay from the balcony is so relaxing. After a morning snorkel in this calm, shallow bay visit unique locations like the Place of Refuge or Keauhou Bay (where you will see an awesome variety of colorful tropical fish, several Green Sea Turtles, and a beautiful array of coral), take a swim and sun bath by the lovely pool that is immediately below your condo! After a day of playing in the sun, shopping or touring, come back to this spacious, 1200 square foot tropical retreat for a laid back barbeque dinner and a spectacular sunset, the highlight of every evening! Or venture out to one of several wonderful restaurants and sunset venues in the area. (Twelve turtles sleep on a lava rock in front of the hotel open air bar, just a short block away, every evening!) Elevator on complex. If snorkeling is your goal, and it should be, I can't imaging a better location. 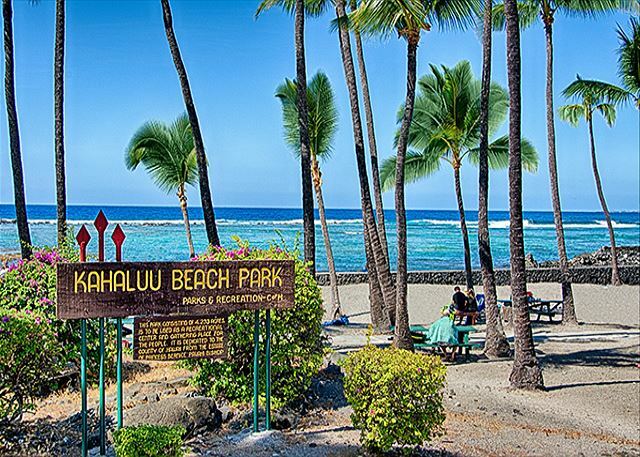 a one-minute walk to the Kahalu'u Beach. We went many times and always enjoyed it. Please note: There are tons of Boogie Boards and various snorkel equipment in the locker! We did purchase snorkel gear for everyone at Costco on day 1. We did, however, enjoy the use of the boards. The property was very clean and we needed nothing. We did receive one complaint from a resident that we were being too loud in the hallways. However, I don't think it was us. We had no small children and were not loud. Note that the property does not have A/C so the fans kept quite a lot. The view was stunning. We enjoyed the pool quite a lot! The property is also located 1/3 mile from the Keauhuo Shopping Center, with a grocery store, restaurants, movie theater, etc. We enjoyed taking drives along Ali'i drive, to see the shops, cafes, and beaches. We loved our stay here. 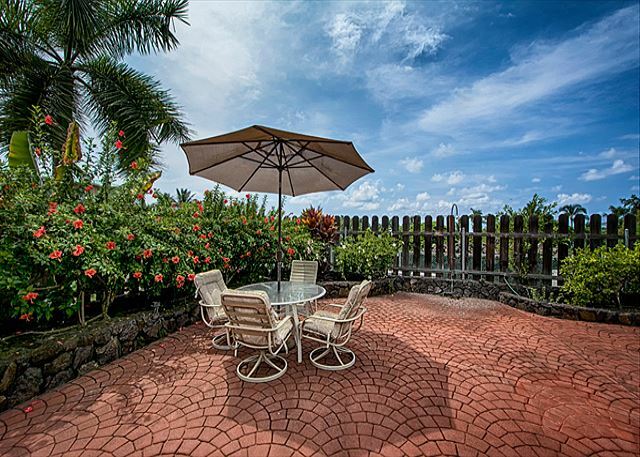 The location is perfect, being across from the beach and close to the grocery store, etc as well as central to traveling either north or south on the Island. The ocean view lanai is the best. The pool is great and usually we were the only ones using it. We look forward to returning someday soon! Highly recommend this to anyone for whom location and a pool is a priority over a modern interior. Easy booking, easy arrival, great communication. Nice spot in a great part of the island. Very pretty. 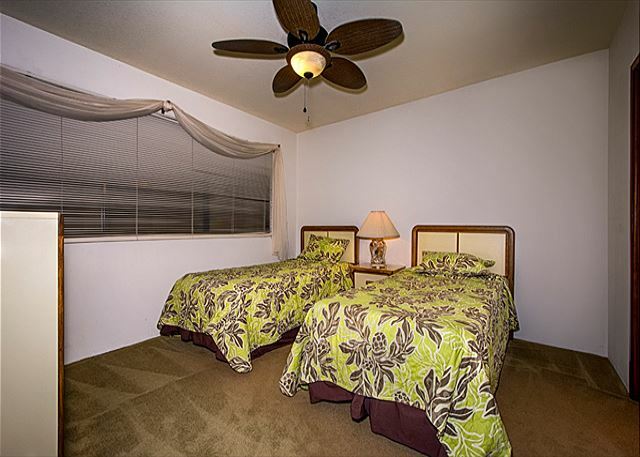 We had a great stay in this comfortable, spacious unit with a fabulous view of the ocean and sunset. Loved the beach across the street and the pool. Even beach chairs and umbrella and some snorkel gear were available . The king size bed is the most comfortable bed I’ve ever had! We’ll be looking for this unit again when we come back next time! Aloha Tanya, thank you for staying with us at KBV304!! Glad to hear you enjoyed the amenities, and a nice night's rest in the king size bed! We can't wait to have you here in Kona with us again. Mahalo! Love the location, an easy quick walk to our favorite snorkeling beach at Kahaluu. Fantastic sunset views from the lanai. Property was well kept - we watched the property staff wipe down and meticulously arrange the furniture around the pool twice during our 3 day stay. 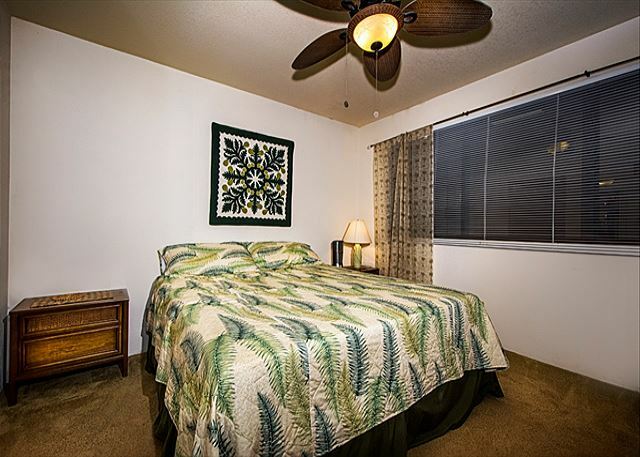 Loved the unit's Hawaiian decor (including palm tree tiles in the bathroom!). Only downside was the heat (96 deg. high/86 deg low outdoors) and hot sun coming through the large windows with no air conditioning. Would definitely go back esp. at a cooler time of year. Aloha Beth, we're sorry to hear that the lack of a/c impacted your stay, but are happy to hear you would consider coming back during the cooler months. Usually, the breeze and fans are enough, but this summer has been particularly difficult. Regardless, we are so pleased that you loved your unit and got to enjoy the lanai's views, and we truly hope to see you on the Big Island with us again soon! Mahalo!! We really enjoyed our stay and accommodations here. It was so great to have beach chairs and boogie boards to use. The unit was well equipped with everything we needed! The space was amazing. The kitchen well stocked. Needs more toilet paper. Beautiful views and the best snorkling beach just across the street. The condo was clean. There are boogie boards,sand mats and chairs in an easy to access storage area in the garage. The reservation, check in/check out process is so convenient and easy. We enjoyed our time at Kahaluu Bay Villas. The location was amazing! We loved the view! The property was clean. We so enjoyed our stay at Kahaluu Bay Villas! The unit that we stayed in offered spectacular views and plenty of space. The kids loved being within walking distance of snorkeling and shaved ice! Thank you. The property was too far from the center of things but it was wonderful having a snorkeling beach across the street. The property was fairly clean upon arrival but does require maintenance to the doors and appliances. It worked well for our family space wise and I would recommend it to others with the note that the decor is a little outdated and worn. Six nights at this easy access location was just what we needed. 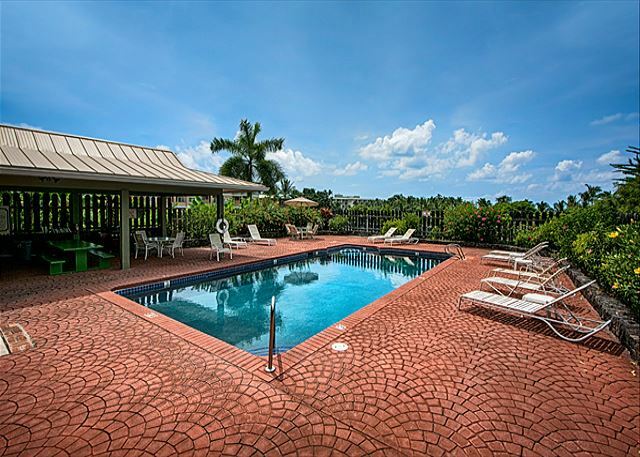 With the pool and snorkel beach on hand this quiet complex suited us perfectly. Well supplied and clean/fresh with sunset views as a bonus. My friends and I had the most wonderful time in Kona. The condo was exactly as described. It stayed cool and the balcony was perfect! It was important for our family of four (two older teens!) 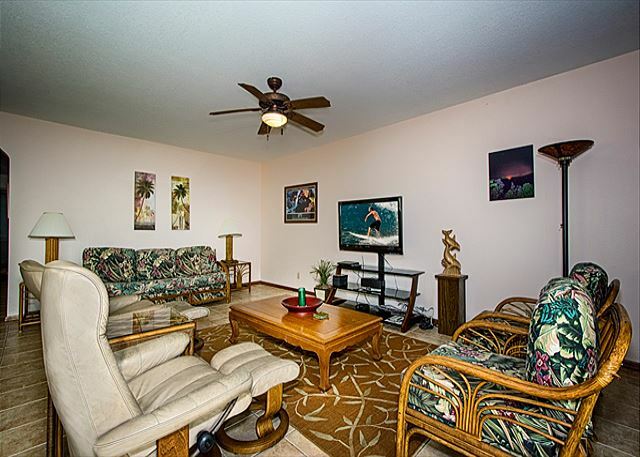 to have 2 bedroom/2bath accommodations, and this condo was perfect. (And immaculately clean.) 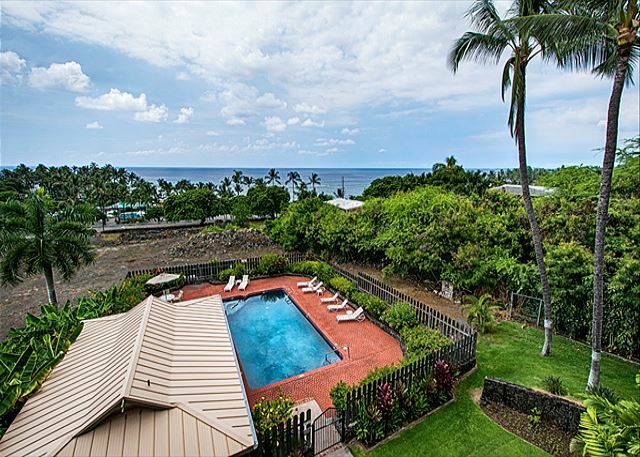 With the snorkeling beach across the street and a short drive (5 mins)to the Keauhou Shopping Center (KTA Super Store (Grocery), Longs Drug, restaurants, cinema, etc.) this was a great location. Blake from Knutson & Associates was responsive to my calls & texts, great to work with. Thanks for a great stay, we hope to return! The condo seemed older but in good shape. The kitchen floor was a bit sticky when we arrived but not a big deal - everything else was nice and clean. We hadn't been to the Big Island before - in general the beaches along Alii drive are small pocket beaches not the long white sand beaches you may find in other places. But if you want to stay on Alii - Kahaluu beach is probably the best - good snorkeling. Our kids enjoyed walking down to snorkel and then playing in the pool at the condo - a hot tub would have been nice for evenings when you get cold swimming but not a big deal. The management was good - the beach gear in the storage unit was helpful. We really enjoyed the location, view and layout of the condo. The view was incredible and the cleanliness of the building as a whole was very satisfactory. I would recommend this condo to friends and relatives. Everything was as expected - very comfortable accommodations, adequate space, well equipped condo. Best feature was the ocean view and the close proximity to the best snorkelling beach! We love this place. We've stayed in two different third floor condos because the view is so great. This year we saw whales breaching right off the coast. Betty N does not recommend this vacation rental. The vacation rental was in a great location and I loved that it was secure and on the third floor. The unit is in bad need of updating especially the refrigerator (even a little sanding and painting it with enamel paint). The towels had to be washed because they smelled musty. Liked that it had 2 bathrooms and a washer dryer. Jill M from Oceanside, CA does not recommend this vacation rental. We were overall satifsfied with the location and the beautiful views. We enjoyed eating several meals on the lanai and the use of the pool after a day of snorkeling. The kingsize bed was comfortable. We were disappointed in the overall condition of the unit. The furniture was very dated and worn and some was in need of repair, ie: bar stool, lamp in bedroom. The coffee maker heating pad was rusted. Also, we had to go out & buy more toilet paper & paper towels. There was no extra stock. I don't know what is meaant by "starter pack" but the unit was not stocked by properly. I understand the owner's may not want to furnish the unit with expensive furnishhings but this place is in need of a makeover and not ot be so stingy on the basic necessities like toilet paper. 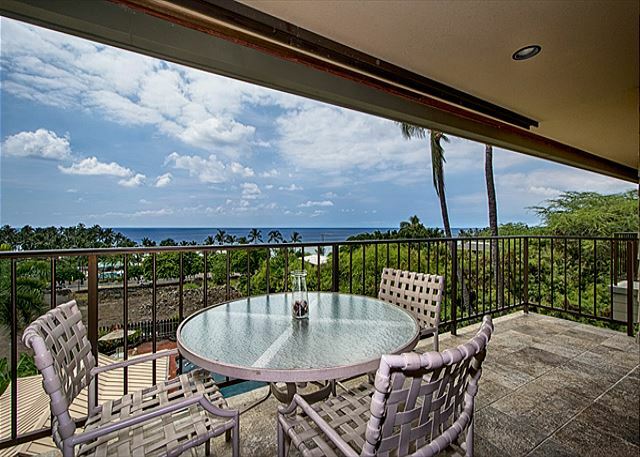 We do enjoy staying at this location and the 3rd floor lanai view to the ocean was spectacular, as was the sound of the ocean. We will return. Only negative (and not something condo owners can impact?) was the loud music and partying from beach park pavilion across Alii Drive. That would not prevent us from returning as there are so many positives. 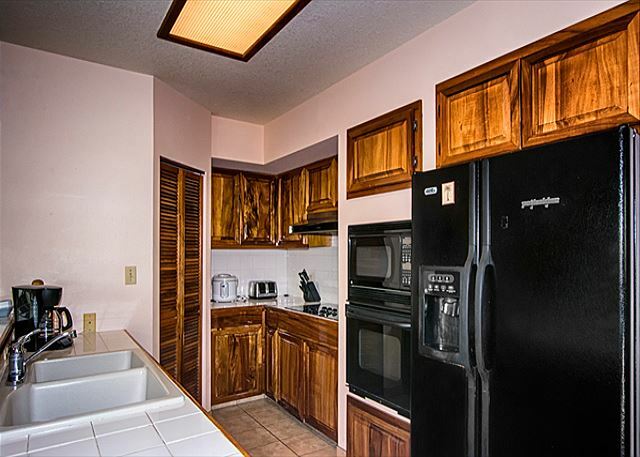 In addition to spacious condo: just a few units so friendly atmosphere, so close to great snorkeling, clean pool & bbq, easy access to beach walking trail and market & shopping center. Just overall, a nice spot and well-maintained. 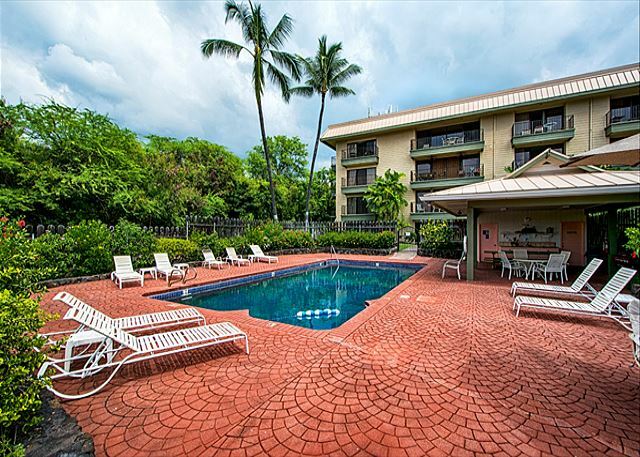 We had a great visit to Hawaii, thanks to this lovely condo, the friendly people, and the difference this Island displays in it'slava flows are all so different and raw! The condo was clean and nicely kept up. There was little missing that you would require for daily living. The beach chairs and boogie board were nice to use as well! Large and roomy with a stunning view, I would definately stay here again! We've stayed in units in this building before, and love the location and amenities: the pool and covered barbecue area, off -street parking, lanai facing the ocean, cool breezes through the condo, views of the sunset, short walk down the street to snorkel bay,... We had a great visit this year at Christmastime in #304 despite some surfy, no-snorkel days.